In March, Dr. Chris O’Connor joined us at MaRS Mornings to share his entrepreneurial journey. His company, Think Research, is focused on improving connectivity in the healthcare system. During his talk, Chris touched on some key points that not only highlight his perspectives on critical considerations for success, but also offer insight into his overall vision for nurturing innovation. Like many entrepreneurs, Chris has no notable background in business. He was working as a critical-care physician at Trillium Health Partners in Mississauga when he identified a significant problem in the healthcare system: physicians were still making orders with handwritten notes. It’s fair to say that this revelation is somewhat unsurprising; massive and complex systems are notoriously change averse. Handwritten orders result in costly inefficiencies and increase the likelihood of errors along the communication trail, which in turn may negatively impact patient care and safety. This was a serious problem. 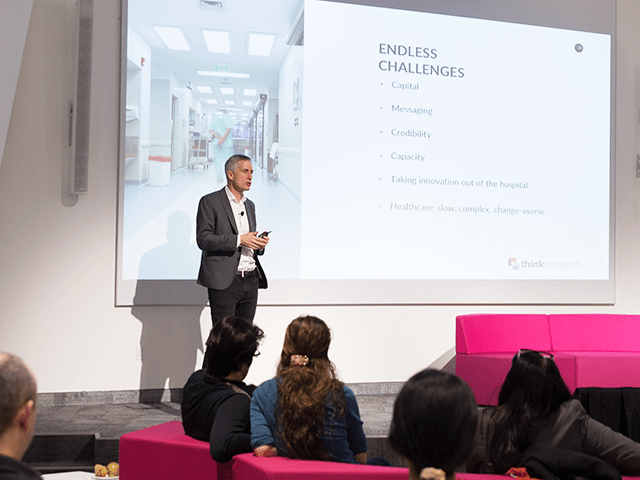 Motivated by his desire to solve this problem, Chris developed the first patient order sets for the intensive care unit at Trillium; ultimately, they were expanded and used in all of the hospital’s departments. Order sets are medical checklists that offer evidence-based treatment options in a single interface. The implementation of the order sets allowed Chris to not only demonstrate significant improvements in the ordering of evidence-based best practices, but also to drive reductions in the use of unnecessary lab tests. In doing so, he improved clinical standardization, patient safety, resource utilization, costs and outcomes, leading to multiple accolades for his innovation. In his talk, Chris emphasized the importance of this step: establishing value lends itself to the story and, importantly, it establishes credibility, which is an essential ingredient in both raising capital and gaining traction. 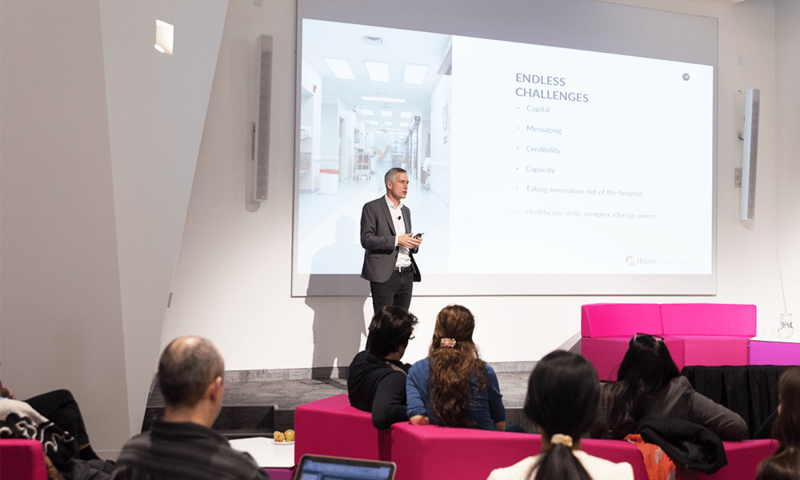 As is often the case in the entrepreneurial journey, after order sets were established, Chris’s focus evolved to a bigger picture: the potential for a cloud-based platform to increase connectivity and reduce knowledge silos across healthcare organizations. And so, Think Research was born. Early on, Think Research was able to build momentum by being laser focused on a minimum viable product, starting virtually, without many offices and people, and focusing on organizations that were not being serviced, like rural clinics, Chris explained. In the spirit of trial and error, the company broadened early by focusing on order sets, e-forms, virtual care and acute care, among other areas. Today, Think Research’s efforts are supported by an online platform that allows over 300 healthcare organizations across Canada and the United States, and around the world, to view each other’s content and share their knowledge across the network. The company’s approach highlights the fact that there is no set path to building a successful business. Far too often, the misconception of having to do it all or avoiding focusing on pitfalls in the business plan are trappings that can ensnare entrepreneurs. It is presumably for this reason that, throughout his talk, Chris highlighted the need for humility and self-awareness. He advised entrepreneurs to truly know their limitations and to surround themselves with good people who can do the things they are not good at.